RAAG DESH REVIEW: INTELLIGENT AND BRILLIANT! Raag Desh is one of the best films of the year, Sreehari Nair raves. Tigmanshu Dhulia’s Raag Desh gives us the best Subhas Chandra Bose we have seen at the movies. A brew of well-prepared speeches and lines that seem thought up on his feet, Dhulia’s Bose can sound stentorian when saying 'Karo sab nyochavar, bano sab fakir' and also sit in a weighing balance pan with sultry enthusiasm even as gold equivalent to his weight is tipped out by a wealthy patriot as his contribution toward the Indian National Army. Played by Kenny Basumatary, this Bose can both heckle you away with petulance and call you back with adoration. In Raag Desh, we watch great leaders walking fast, talking fast and getting knocked over by their sense of themselves. When Dhulia gets going, even Jinnah isn’t secure inside his portrait. A Muslim League supporter comments that the portrait would have played out better if Jinnah wasn’t holding his pet cigar. Jawaharlal Nehru asks a prisoner’s father if he wants Nehru to defend his son in court and the father (Kanwaljit Singh) reminds him that he hasn’t been practicing for a long time now. Nehru himself underplays his enthusiasm for Gandhi, making quick visits to jails and pumping up the platitudes. In Raag Desh, Dhulia doesn’t caricature these leaders; he dreams them up and reshapes them in the image of his own psyche, of his own comic logic. And we get it: the leaders don’t quite know they’re historical figures yet and so Dhulia’s subtle satirising doesn’t really come off as ridiculing. On the contrary, his approach humanises these textbook figures and makes them leap out of the pages. While it has been marketed as a patriotic film, Raag Desh is actually a satirical, highly intelligent film that cloaks its many ironies and complications with patriotism. Look closely and you will see that its major fault perhaps is its unwavering ambition; that it just can’t think straight. I don’t know about you but I consider that the mark of true art. If there’s a natural tension in the film, it stems from our knowledge that we’re watching a director who understands the power of cynicism and the kick of subversion, but who’s here trying a subject of straight patriotism. But Dhulia isn’t interested in history with a capital H.
He doesn’t strip the freedom struggle off its idealism, only gives us a personal reading of it. The film concerns the British-Indian Red Fort Trials of 1945, by court-martial, of the officers of the Indian National Army. The trials had heated up the demand for India’s independence and, in this, Dhulia sets us up for a face-off between the British and Indian civilians. An Indian civilian stops a carriage and asks the traveller to step out. And out comes another Indian, all swearing. The revolutionary carriage-stopping civilian apologises and they say goodbye to each other over chants of ‘Jai Azad Hind Fauj’. The movie keeps on adding such layers, is so hip and has such an unsettling rhythm that when Dhulia, in the end, dedicates the film to those who fought for India’s freedom, we may be left wondering whether to take his dedication straight. Dhulia, however, is serious about his dedication. A good part of the director is moved by the most obvious things but he also has a mind that has been assaulted by those cheap Rs 2 Pulp Weeklies. Those two sensibilities together are what give many of his movie scenes their pop-shocker quality. I don’t think he gets called that but Dhulia is actually ones of our best Dark Satirists. What perhaps attracted Dhulia to the film's subject was the very paradox that the officers of the Indian National Army had to face in the course of their operations: they had to kill other Indian soldiers. While Dhulia’s staging of the battle sequences are quite square, he and cinematographer Rishi Punjabi turn up with the after-battle effects: there’s a shot of the dead soldiers all looking mummified in shock. 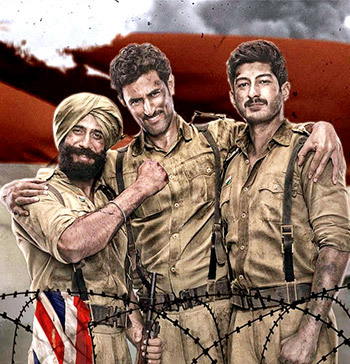 The three INA soldiers whose trial forms the basis for the narrative are Shah Nawaz Khan (Kunal Kapoor), Gurbaksh Singh Dhillon (Amit Sadh) and Prem Sahgal (Mohit Marwah). Dhulia inter-cuts scenes of them being raked over the coals in court with scenes from their combat days. The story of these soldiers defecting from the British-Indian army and deciding to join the INA isn’t presented in a cheerful tone as in Vishal Bhardwaj’s Rangoon. We get the soldiers’ weighing of their choices: their patriotism itself is a matter of deliberation and not an immediate Yes! The INA soldier, who welcomes them into the new family and invites them to join forces with the Japanese army, is chased out by the Japanese military and the war and its codes soon become a fool’s game! Dhulia shows us both the heartwarming and bloody-corporal side of combat-brotherhood here. Performance-wise, the film is a revolt of brilliant actors who were yet to receive their due. Kanwaljit Singh is, for my money, one of the three all-time Gods of Indian Television -- Sudesh Berry and Ronit Roy being the other two. Singh is in top form here, as the helpless yet positive father of Prem Sahgal, his performance a wonderful fusion of old-world refinement and modern attitude. Vijay Varma, whose smartie-punk-tormentor act in PINK was probably the best thing about that film, plays a journalist here, and you can’t take your eyes off him. A terrific physical actor, watch out for Varma in that scene where he argues with Muslim League leaders with a cigarette in his hand -- he has some of the same intensity as that of the early De Niro. Rajesh Khera’s Nehru deliberates over pursed lips, half-smiles and an erect posture. We know it’s always Khera playing Nehru, just like this film is a patriotic movie but set in Dhulia-land. Mrudula Murali, as Lakshmi Swaminathan, gets a brilliantly conceived scene of her marriage proposal being disrupted by marching soldiers. Her accent keeps flip-flopping but she has great presence and a smile that arrives without notice. While it’s the actors who aren’t on the posters who dominate the proceedings, Kunal Kapoor, Amit Sadh, and Mohit Marwah are all terrific too. You get a sense of the history the three of them share by just watching them together. They maintain their poise even when pointed at by the prosecution lawyer: Dhulia uses their stony stances like imageries. There is an inventively shot sequence where Vijay Varma’s journalist character emerges from a bar called Dragon Bar, and is then is led through the backstage of a revolutionary hideout place to the to the top of a wreckage site amid staging of mock protests. On the flip side, the British are all portrayed as swine with close-ups of their English mouths detailing the charges or making slurs. The film's editing is weak but it would have hurt more if Dhulia was going for an epic here -- which he thankfully isn’t. One goes to the movies to be surprised, to feel something fresh, to sense a new spirit and Raag Desh is infused with that new spirit. Its real daring though is that it never plays up things it is doing new. And when it tries and fails, it still is a noble failure. This is one of the best Hindi films of the year.